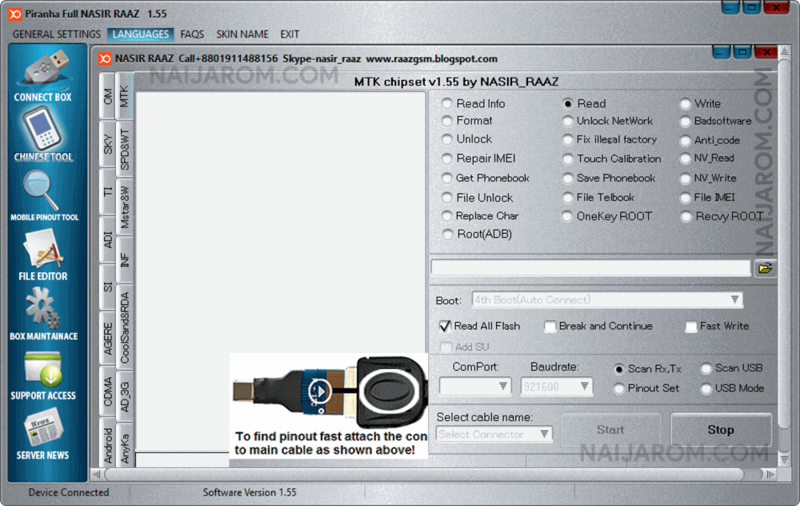 Piranha Box 1.55 Tool is service tool which allows you to read the device information, write the stock firmware, format the device, unlock the network, fix the bad software, unlock the device, fix illegal factory, repaid the IMEI of device. Fix the Touch Calibration, Read the NV Data, Get the Phonebook, Save phonebook, Write the NV data, File Unlock, File Telbook, File IMEI, Replace Char Characters, Onekey Root the device, Recovery Root, Root using the ADB method. It also allows you to Read the Information of any Chipset, Write any Information on the device, Unlock the device. It also supports Coolpad and RDA chipset including the read info, write info, format the device, unlock the device, repair the IMEI, read NV, Write NV. [*] Credits: Piranha Box 1.55 Tool is created and distributed by Piranha Team. So, full credits goes to Piranha Team for sharing the tool for free.